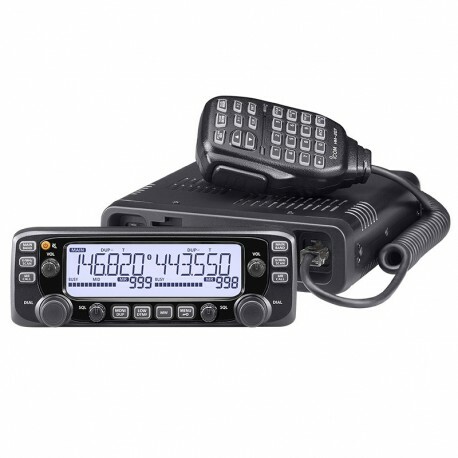 The IC-2730A provides VHF/VHF, UHF/UHF simultaneous receive capability as well as VHF/UHF receive. Main dials, volume, squelch knobs and primal buttons are symmetrically laid out for each band. The optional VS-3 Bluetooth® headset can wirelessly control the IC-2730A with three programmable keys and a PTT button. It also provides VOX operation for hands-free communication. * Optional UT-133 Bluetooth® unit must be installed in the IC-2730A. The display size of the IC-2730A is 1.5 times larger than its predecessor, the IC-2720H. Frequency display and channel names are larger, and the white backlit provides higher contrast. The combination of the optional MBF-1 suction cup mounting base and MBA-5 controller bracket provides easy tilt and swivel adjustments. The large suction cup can be mounted on flat surfaces and can be removed easily. The IC-2730A employs a durable PA module and delivers 50 watts of high power operation on both VHF and UHF bands. The CTCSS and DTCS tones are built-in for quiet stand-by and repeater access. The split tone function allows you to set CTCSS/DTCS tones separately for repeater uplink and downlink on a per channel basis. With the optional MBA-4 combination bracket, the controller can be attached to the main unit. The microphone jacks are mounted on both the controller and main unit. The IC-2730A covers 118–174 and 375–550MHz. You will be able to listen to aviation, marine, weather channels and other utility communications. The optional active noise canceling microphone HM-209 can automatically reduce noise in extremely noisy environments and assist in transmitting clear and accurate audio.